Often, attention is often given to low-carb diets, but you may be wondering if eating a diet high in carbohydrates is really that bad for you. The good news if you're a carb lover is these diets may not be as bad as once thought. They are even beneficial for certain population groups. Knowing the pros and cons of high carb eating will help determine if this type of diet is a good match for you. What Is a High-Carb Diet? There's no official definition for high-carb eating plans. The Institute of Medicine suggests getting 45 to 65 percent of your calories from carbs (225 to 325 grams daily when eating 2,000 calories per day). A 2015 study published in The American Journal of Clinical Nutrition classified diets containing 53 percent of calories from carbs as being high-carbohydrate diets. Based on this research, diets providing more than 53 percent of calories from carbs can be classified as high-carb, but some carbohydrate recommendations for athletes go up to 70 percent of calories. When following this type of diet, you'll generally consume 55 to 70 percent of your calories from carbs. The number of grams of carbs you should eat depends on your daily calorie needs. Because carbs contain four calories per gram, a high-carbohydrate diet contains about 275 to 350 grams when eating 2,000 calories per day. (Nuts, seeds, non-starchy vegetables, and soy milk contain lower amounts of carbs). When planning meals, don't be as concerned about choosing certain carbs over others. Instead, make sure you're getting foods from each healthy food group -- and a variety of fruits, vegetables, whole grains, dairy foods or dairy substitutes, lean protein foods, and healthy fats. Regardless of whether you're following a diet high in carbohydrates, consuming too much added sugar can be problematic. It can lead to unwanted weight gain, diabetes, tooth decay, and nutrient deficiencies. Getting natural sugars from fruits and milk is part of a healthy meal plan. While natural sweeteners like honey may contain a few more micronutrients than table sugar, these sugars should still be limited because they add extra calories to your diet, but few essential nutrients. The American Heart Association recommends women get no more than 100 calories daily from added sugar, and men should not exceed 150 calories of added sugar per day. This equates to 25 grams for women and 38 grams daily for men. Frutarian diets are similar to vegan dieting, but are high in carbs because the majority of foods consumed are fruits. While fruits are packed with vitamins and are part of any healthy meal plan, following high-carbohydrate fruitarian diets can be harmful. Cleveland Clinic reports fruitarian diets put you at risk for nutrient deficiencies, a slower metabolism, weight gain, tooth decay, and diabetes. 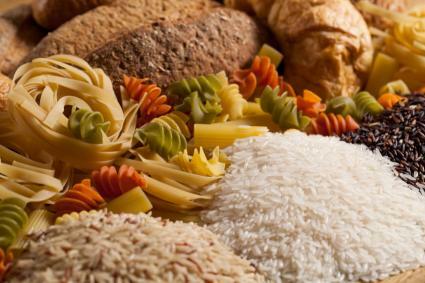 Glycemic index (GI) describes the rate at which your blood sugar level rises after eating carbohydrates. Low-glycemic index foods cause your blood sugar level to rise more slowly than high-GI foods. High-GI foods will give you a quick boost of energy, which can be beneficial when working out or playing sports. However, Harvard School of Public Health notes foods with low GIs help control blood sugar in people with type 2 diabetes and aid in weight control. Diets high in carbohydrates are generally lower in fat. The Institute of Medicine suggests getting at least 20 percent of your calories from fat, and fat provides nine calories per gram. Low-fat diets often contain 20 to 25 percent of the calories from fat, which equals 44 to 56 grams of fat daily when eating 2,000 calories per day. If you have a condition like gastroparesis, your doctor or dietitian may recommend a low-fat diet. Many carb-rich foods like fruits, vegetables, and whole grains are packed with essential nutrients. Diets high in carbs are often beneficial for athletes, because carbohydrates are the body's main source of energy -- especially during exercise. The U.S Anti-Doping Agency suggests athletes get 60 to 70 percent of their calories from carbs to maximize performance. Furthermore, low-fat, higher-carb plans are more effective for fat loss in obese individuals than low-carb, higher-fat diets, according to one 2015 study. You have to watch your dietary fat intake when following a diet high in carbohydrates so you don't exceed your body's daily calorie allotment and experience unwanted weight gain -- especially if you're not working out regularly. Furthermore, if you're eating lots of carbs and not enough protein, you might feel hungrier since protein increases satiety. If you have diabetes, a high-carb diet likely isn't for you. A 2015 study in The American Journal of Clinical Nutrition reports lower-carb diets achieve greater improvements in blood sugar control and reduce the need for diabetes medications in people with type 2 diabetes. Following a high-carb, low-fat diet may have similar effects on disease risks as low-carb dieting. However, keep in mind your total calorie intake is important. One 2012 study found both low-carb and low-fat diets were effective for weight loss, abdominal fat loss, and disease-risk reduction. However, for weight loss to be effective, you must burn more calories than you eat, regardless of the composition of your diet. If high-carb sounds like it might be the diet for you, consider the following sample meal plans, which is a full day of meals totaling 2,029 calories and 332 grams of carbs (65 % of calories from carbs). This meal has 493 calories and 87 grams of carbs. This fish taco meal contains 443 calories and 53 grams of carbs. This meal contains 470 calories and 69 grams of carbs. This snack contains 238 calories and 39 grams of carbs. This snack has 256 calories and 50 grams of carbs. This snack has 129 calories and 34 grams of carbs. Diets high in carbohydrates aren't for everybody, but they appear to be not as bad as once thought, especially for athletes and people who work out regularly.